One of the main concerns is the strength of US consumption. The strength of the recovery in the US is important not just for the global economy, but also for exporters to that country. And, within the US, the bulk of the growth comes from consumption. Indeed, the US consumer often used to be compared to Titan, holding up the global economy single-handedly. Fuelled by cheap credit, US household debt increased rapidly, fuelling a consumption binge that sucked in vast amounts of imports and resulted in a huge current account deficit. That, in turn, resulted in the surpluses of countries such as China, surpluses that were then ploughed back into the US and these funds helped to keep US interest rates low. In 2008, US private consumption was around $10 trillion (Rs480 trillion), European consumption was around $9 trillion, while Asian consumption was $5 trillion. Writing in the latest issue of the International Monetary Fund’s Finance and Development magazine, economist Francesco Giavazzi points out: “Before the crisis, US private consumption accounted for about 16% of global output. 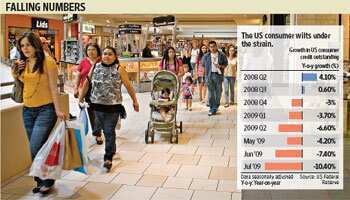 It is not surprising that the economizing by US consumers has pushed the world economy into a deep recession. Nor is it surprising that demand expansion in emerging economies—such as China, India, and Brazil—though on the rise, cannot compensate for the fall in US buying." A Federal Reserve report says that the percentage of banks tightening lending standards to consumers is steadily dropping. So it’s not as if banks are reluctant to lend to consumers—it’s consumption that is coming down. In uncertain times, people are likely to save more. That should mean lower growth for the US and a tepid recovery. That, in turn, will mean that US policymakers may keep monetary policy loose for a long time, which will mean continuing liquidity and support for higher asset prices.